Several people have asked for an explantion of calendrical data provided on the above pages and/or further information about the calendrical terms in the various languages and scripts used, and this blog post is an attempt to answer such questions. I am by no means an expert on the Chinese calendar, so I won't go into too much technical detail about calendrical calculations, but I attempt to provide the minimum information necessary to understand the data provided on my "Today's Date in ..." pages. Cyclical year, cyclical month, cyclical day, and cyclical hour. ᠪᡳᠶᠠ tob biya "principal month"); Jurchen = "spring month"; Khitan = "head month"; Tangut = "principal month". There are various systems of naming months in Mongolian (see Brian Gregory Baumann, Divine Knowledge: Buddhist Mathematics According to the Anoymous Manual of Mongolian Astrology and Divination (Brill, 2008) pp. 70–83). Extant Mongolian Phags-pa texts use the system referred to as "Black Chinese Mathematics" in Table IV.8 in Baumann pp. 72–73. In this system, months are named as initial, medial or final Spring, Summer, Autumn or Winter month. The Mongolian Phags-pa word for a leap month is unattested, and has been reconstructed from Classical Mongolian, which is a borrowing via Old Uyghur of the Chinese word rùn 閏. An intercalary month is also called saban sara in Classical Mongolian. When followed by a date, the Middle Mongolian and Classical Mongolian word for month, za ra/sara is put in the genitive form, za ra yin/sara in. When followed by a date, the Manchu word for month, ᠪᡳᠶᠠ biya is put in the genitive form, ᠪᡳᠶᠠᡳ biyai. Jurchen dates do not show a written genitive form of the word bia "month" before a date. Jurchen does have single-character words for "eleven" and "twelve", cognate to Manchu omšon and jorgon, and it is possible that the 11th and 12th months were written as omʃo inəŋgi and dʒïrxon inəŋgi during the Jin dynasty. However, no Jurchen inscriptions dating to the Jin dynasty mention the 11th or 12th months, and in Ming dynasty Jurchen texts the 11th and 12th months are written as "ten-one month" and "ten-two month". The Khitan Small Script numbers one through nine occur in dotted and undotted forms, but only the undotted forms occur before the word "month". Manchu days may use ᡩᡝ de instead of inenggi. Middle Mongolian dates do not give the word "day" after the day number, but the 1st through 10th days are followed the word ši nė "new". In narrative contexts the last word of the date is in the dative, but is given in the nominative on my calendar pages. Jin dynasty Jurchen inscriptions use a mixture of the forms in the "Jin Dynasty" column and the "Ming Dynasty" column, but Ming dynasty Jurchen inscriptions and texts only use the forms in the "Ming Dynasty" column. Ming dynasty Jurchen texts also use the prefix itʃə "new", cognate to Manchu ice, for the 1st to 10th days, but this prefix is not used in any extant Jin dynasty Jurchen inscriptions. The Khitan Small Script numbers one through nine occur in dotted and undotted forms, but only the undotted forms occur before the word "day". The Chinese solar year is divided into 24 equal periods marked by points 15° apart on the ecliptic, known as solar terms 節氣. Twelve of the solar terms, at 30° intervals, are nodes (jiēqì 節氣), and each of these nodes mark the start of a new solar month (see "Cyclical Month" below). The other twelve solar terms are midpoints (zhōngqì 中氣), and these are used in the calculation of intercalary months. Each solar term falls on approximately the same day each year according to the Gregorian calendar. For the Old Mandarin and Manchu calendar pages the solar term will be displayed in the second column from the left if the selected day falls on a solar term. Solar terms are not displayed in the Jurchen, Khitan, Mongolian and Tangut calendar pages as I do not know what the solar terms are called in these languages. The cyclical year is named according to the sexagenary cycle of 10 heavenly stems (天干) and 12 earthly branches (地支), and repeats every sixty years. The ten heavenly stems can be divided into five pairs, with each pair corresponding to one of the five elements (五行) and five colours. The Manchu, Jurchen and Khitan sexagenary cycles use the five colours instead of the ten heavenly stems for the first cyclic element, and in the case of Manchu, each colour is subdivided into two shades, each corresponding to one heavenly stem. The Tangut sexagenary cycle has ten terms corresponding to the ten heavenly stems of the Chinese tradition, but these terms are not translations or transliterations of the Chinese terms, but are semantically more closely related to the five elements. The terms corresponding to the 10 heavenly elements used in the various languages are shown in Table 6. The 12 earthly branches correspond to twelve zodiacal animals, and the Manchu, Jurchen, Mongolian, Khitan and Tangut sexagenary cycles use the names of the zodiacal animals instead of the earthly branches used in the Chinese tradition. The terms corresponding to the 12 earthly branches used in the various languages are shown in Table 7. The exact meaning of the secondary manchu colours is not certain. Sometimes they are translated as "light green", "light red", "light yellow", "light white" and "light black". The Small Khitan words for "gold" and "white" occur in undotted and dotted forms. The undotted forms of "gold" and "white" are most common preceding the name of a zodiacal animal, although dotted forms are occasionally attested before the name of a zodiacal animal, but usage is not consistent in the extant inscriptions. The Small Khitan words for "green", "red" and "black" each occur in two spellings, with different final phonograms. However, there is no consistency in extant inscriptions about when to use which spelling (different spellings of the same colour word may be used before the same zodiacal animal in different inscriptions), and so in my Small Khitan calendar the same colour term is used before all zodiacal animals. The various attested terms for the five colours that occur before names of the zodiacal animals in fifteen Khitan Small Script epitaphs are listed in Table 8. Although modern Mongolian cyclical terms use the five colours, Classical Mongolian texts generally use transcriptions of the Chinese names for the ten heavenly stems. Cyclical year dates in extant Mongolian Phags-pa inscriptions and manuscripts only give the zodiacal animal, and don't use a stem or colour in naming years, so the Phags-pa spellings for Middle Mongolian in this table are reconstructed from the Classical Mongolian spellings of the ten heavenly stems given in Grøbech and Krueger, An Introduction to Classical (Literary) Mongolian (Otto Harrassowitz, 1976). The Khitan large script words for rabbit, snake and monkey may also be written with the two characters ligated together vertically to fit a single character space. The Mongolian Phags-pa spellings for "goat" and "pig" are not attested, and have been reconstructed from Classical Mongolian. The Mongolian Phags-pa word for "ox" is only attested once, where it is spelled ꡜꡦꡟ ꡁꡦꡘ hėu kʽėr; but hėu is not used in Mongolian Phags-pa orthography, and is probably a mistake for ʼėu (Junast takes it as a mistake for hu, which seems less plausible to me). The cyclical day is named according to the sexagenary cycle of 10 heavenly stems (天干) and 12 earthly branches (地支), and repeats every sixty days. The calendrical "hour" actually lasts two hours, with each day and night divided into twelve equal-lengthed "hours". The cyclical hours are named according to the sexagenary cycle of 10 heavenly stems (天干) and 12 earthly branches (地支), and repeats every sixty hours (i.e. every five days). Within each day, the same zodiacal animal corresponds to the same "hour". 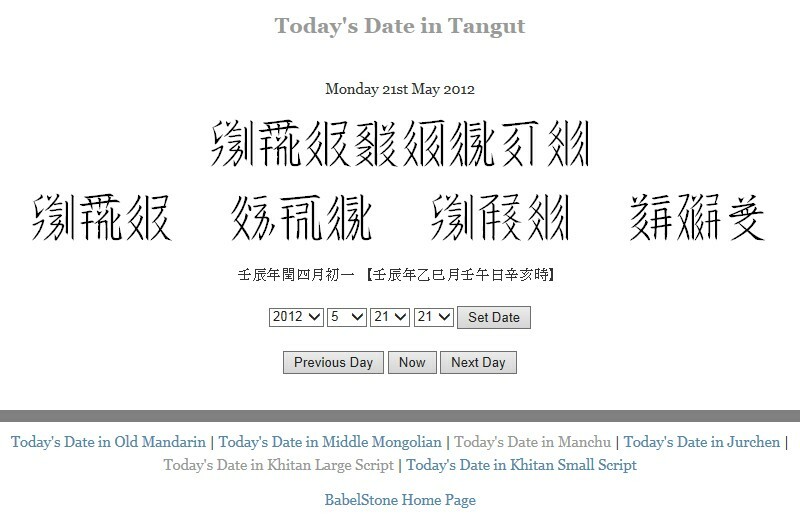 If Tangut characters do not display correctly, please download and install the Tangut Yinchuan font.